I may still be in the honeymoon stages of this, but it's a HIT!!! I'm just loving it. I've got my calendar stuff on the right side with what is happening on each day and if a to-do item needs done on a specific day. Important notes at the top. 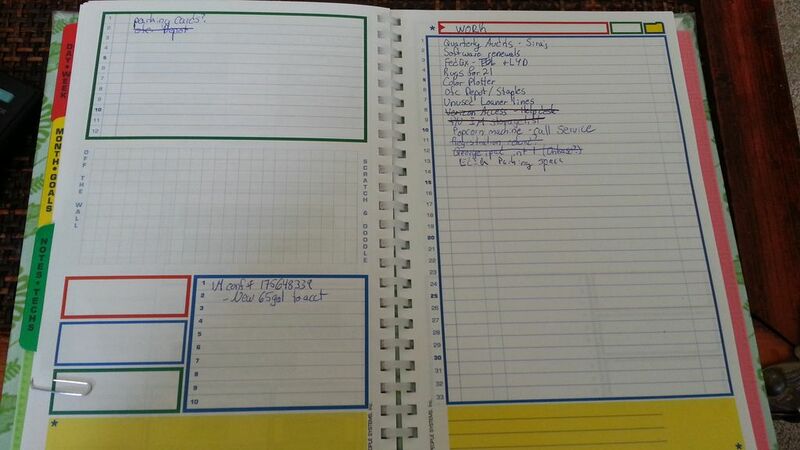 Left side has to-do lists, calculations on workout goals and nutritional intake. And some small budgeting notes and goals, as well as a "doodle" section. I just wrote in fun little inspirational words. But I can use it for notes on a specific project in the future if I need it. It honestly helped a lot to keep me inspired this week to keep up with my new workout regimen and nutritional needs. Project list, meeting notes, etc. And of course more sections for doodles or more notes if I need. Yay!! 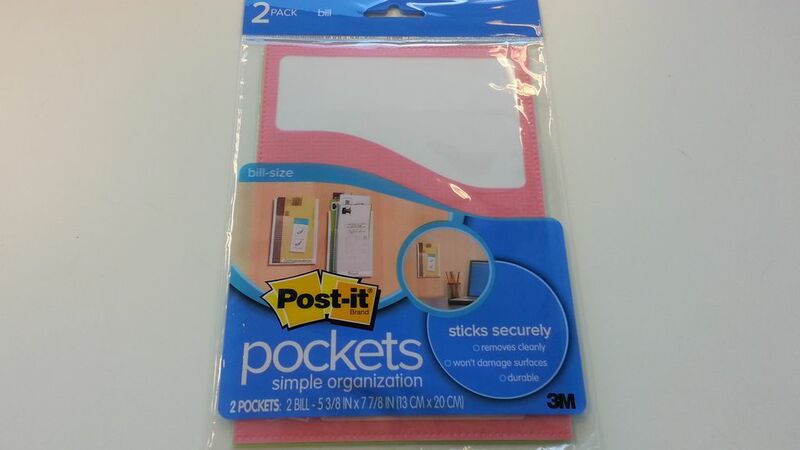 So, also last week I bought some mountable pockets. They're shown to be used in school lockers or stuck to the wall, but I thought they'd be perfect for the insides of the covers. 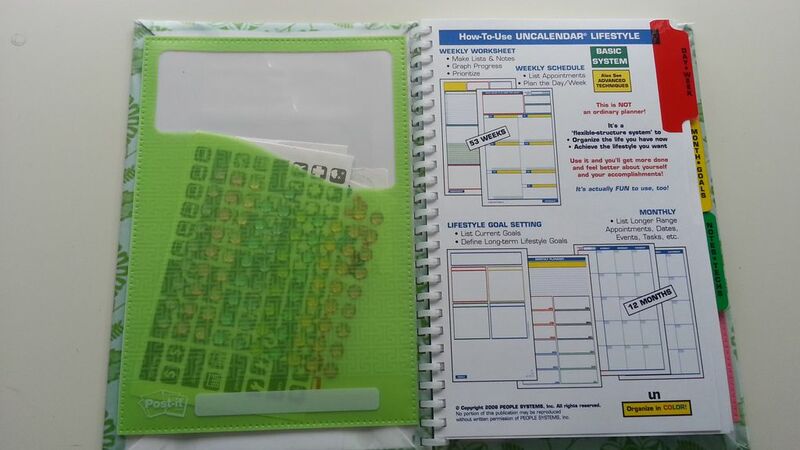 There were 2 in a pack, and as luck would have it the colors I got (lime green and pink) matched my planner perfectly!!! I took them out of the pack and was a bit dismayed at the mounting side. Just one little sticky at the top. I was envisioning it would be adhesive on the entire surface. This would not do, so I had some double sided mounting squares at home and added some more to the bottom and middle of the pockets. Then stuck them to the covers! 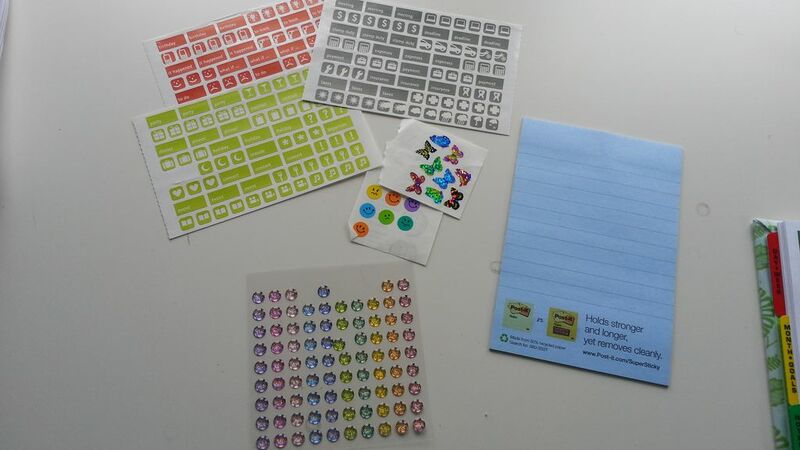 I had some stickers and a thin pad of lined post it notes to put in the pockets. Then put it all together!! I was sold on the Uncalendar system at first glance. I'm glad I finally took the dive and got one for myself. And glad I could personalize it and make it fit for me. I highly recommend this system for busy folks who have to balance a lot of things. Well back to project son my to-do list. :D Hope everyone is having a wonderful weekend. Much love!! Just found your two "uncalendar" posts after doing a google search for uncalendar reviews. I love your covers and how you customized with pockets. 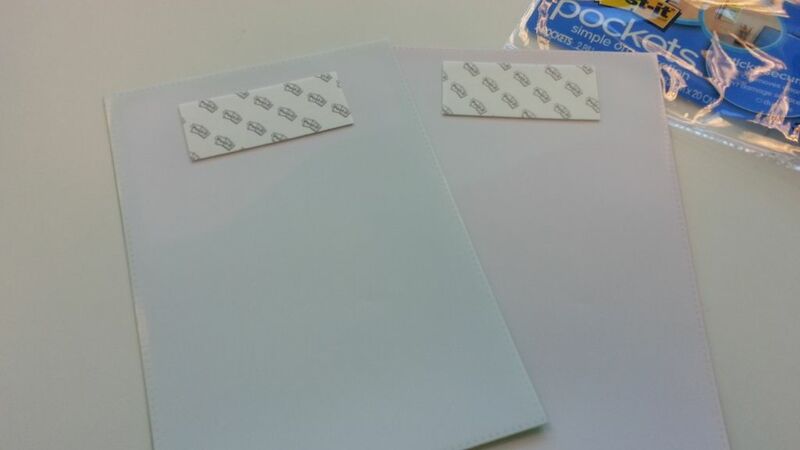 I have 3 questions -- Did you make your own dividers? Are you happy with the half-size? What binder system do you use that snaps open and closed? 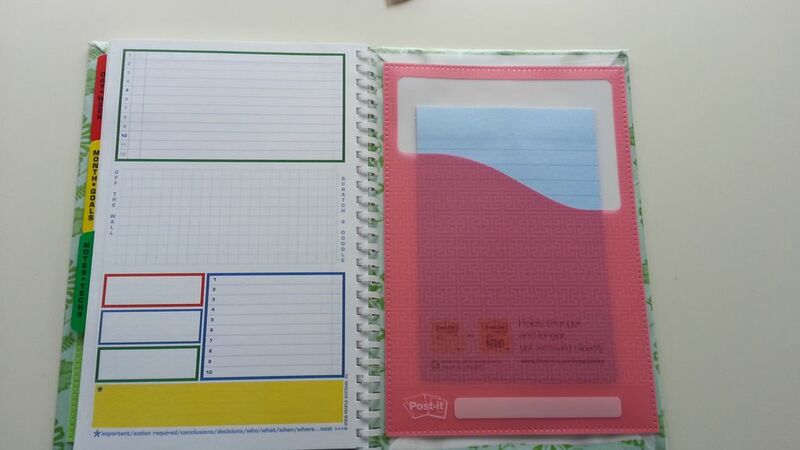 It looks nice & compact (more like a spiral) unlike standard ring binders. Thanks! Thank you so much!! I am still in love with my system here. I am panning to make a video as soon as my hand heals, and go into more details. 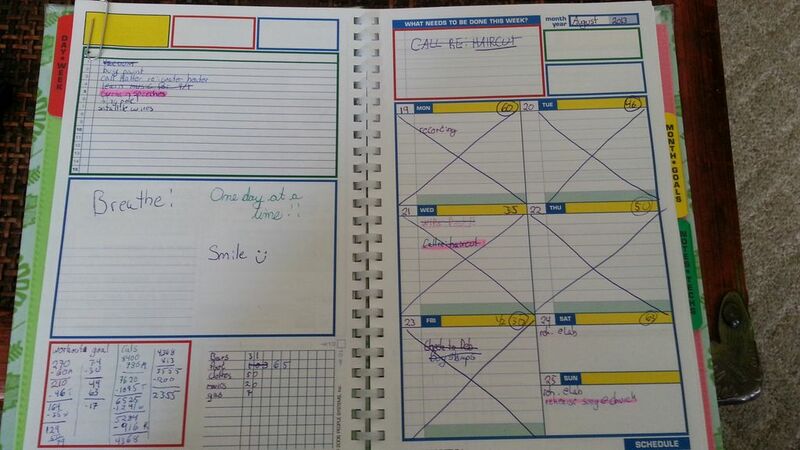 I used the dividers that came with the Uncalendar. I love, love, LOVE the half size because it fits in most of my purses. There is obviously less writing space, but I don't need any more than what I have! It works great for me! The binding spine is a GBC Pro-Click. We have them at work, but I'm sure you can order them, or even get them at Staples or Office Depot. They're 11", but i just snipped off the end so it fits my half sized notebook.